Welcome to day 2 of this month's Neat and Tangled release week. All of the products shown this week will be available for purchase this Friday morning. 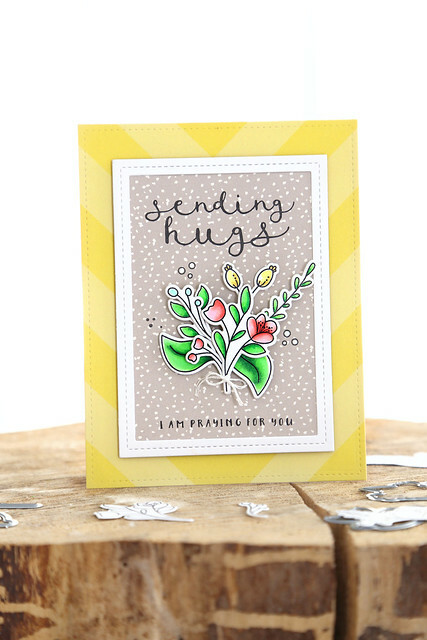 Today, we're showing off a new set designed by Miriam, called No Words. It is filled with messages of love and support for when there are really... no words. I paired the sentiment set with some florals that I designed (you'll see more of them tomorrow!) I stamped and die-cut some of the smaller sprigs and arranged them into a bouquet. I tied them with a bit of twine and framed out the bouquet with heartfelt sentiments from No Words. The patterned paper are a bit of an ecletic mix (the one directly under the florals is from a Christmas pack!) but I like how they work together. I hope you like what I've created today! Be sure to leave a comment here before you go - one person will win a 25$ gift card to the NT store from among the design team blog comments. And be sure to check out the NT blog for all of the design team inspiration - click! Very pretty! Love this new set! What a beautiful stamp set...and an even more beautiful card! Love the gorgeous floral spray! The sentiments in this set are just perfect. Love the little floral sprig. A really sweet and lovely card. I love the flowers you designed! Can’t wait to see more of them tomorrow! A very colorful card. Love the flowers and the sentiment font. Pretty sentiment! Love the frame around the flowers! I am always impressed by anyone who can use patterned paper as well as you did. Beautiful card. Love your design of the stamp set. so pretty--I like the papers you used. Love the words in script. Love your little bouquet and this sweet card! You’ve made such a super lovely bouquet !! So pretty! I really like that you stamped on patterned paper, never tried it! Such a pretty card! I like the floral stamp set and the colors you used. What a lovely card! That flower bouquet is just so sweet and it really pops off that background!! I can't wait to see the stamp set!! Beautiful!! 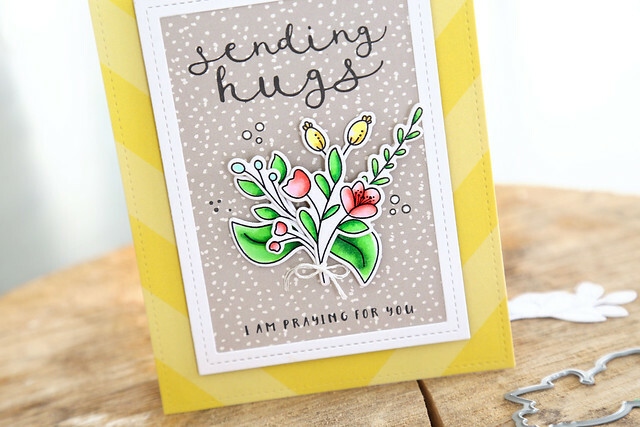 Your flowers are gorgeous and the patterned papers definitely work perfectly together and with the image! Beautiful! Those colours are awesome together...so Springy lol. Love this flower over the background.. pretty card.